Eighteen years have passed since Justin’s mother broke the God of Light’s curse, freeing humans from the bonds of slavery. Justin is heir to the throne of the Dark Empire his mother built from the ashes, but he is a Red Wizard, an order opposed to the war between the religions of darkness and light - an apostate. But when a beautiful red-haired knight comes for vengeance, prophesying return of the storm dragons and wielding a sword of light, the fuse of war is lit. To stop it, Justin can no longer sit on the sidelines. Torn between family and love, he will have to make a choice, and put his faith in someone or something other than his magic. 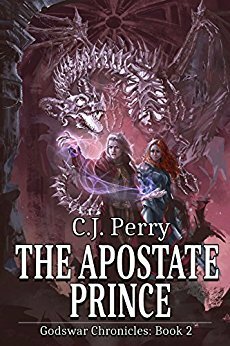 After reviewing Dark Communion, I was ecstatic when Perry asked me to review The Apostate Prince. Now, I'm excited to share my review with you. Just like in Dark Communion, Perry spends a lot of time creating fantastic characters. I loved that he was able to build not only shape shifting characters, but characters who struggled so much with their identity. Justin became more realistic as the story progressed. My favorite character, however, was Celia. I admire her dedication to her father after his death and appreciated her bravery. I absolutely died at the end of the book because of her actions. Perry outdid himself when he described each of the battle scenes. I felt like I was part of the action and found myself waiting for the characters to burst out of my Kindle. Way to go, Perry! Unfortunately, there were a few places where I thought Perry could have done a better job. Even though I had read Dark Communion, it was difficult to remember enough to make sense of this story in certain places. Too often, Perry made references to the first book without giving a reader enough information to truly recall the event. Therefore, this is not a standalone novel and should be read immediately after finishing the first installment. Additionally, Perry waited far too long to get into the meat of the action. I know that there was a lot of information he wanted to share with the audience, but I felt that this could be done alongside the action. In my opinion, he waited because he wanted the audience to really get to know Justin before the information started. I just wish he had found a different way to do so. Overall, I truly enjoyed this book. I'm not sure if there are plans for a third book, but I hope there are and I hope it gets here soon! Thanks for reading and the wonderful review Ms. J! !